I share a lot of frugal living tips and budget friendly recipes here so I thought I’d share the most frugal recipe of them all: beans and rice. I actually really enjoy beans and rice which is good since it’s so easy and cheap to make. This version has chicken, but you could always omit that to save even more. I love it because it’s easy, filling and good for you! So here’s my version of this extremely frugal and versatile dish. I would normally add a can of Rotel (diced tomatoes and peppers), but I didn’t have any on hand this time. Step 3: Mix all ingredients and eat with tortilla chips! I hope you will try this easy and frugal recipe because it really is tasty! Do you eat beans and rice? If so, what do you add to it? I’d love to know! Cook rice per box instructions. Sauté peppers and onions over medium heat until soft. I love beans and rice. Hey! I was thinking about your list of freezer meals under a certain amount. Can you email me? I'd like to do some posts on budget recipes. I'd love to collaborate. 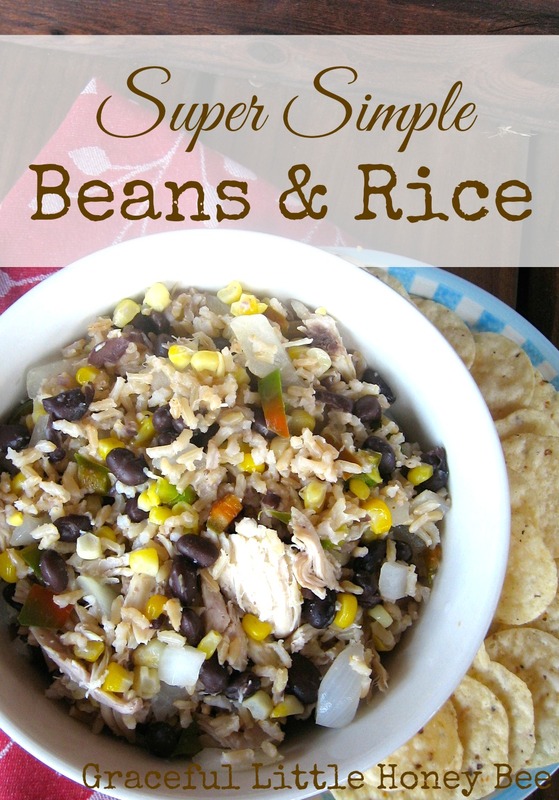 I love beans and rice and as a single mother, I LIVE off of this stuff and I'm always looking for different variations. I usually omit the meat - since it's just me - and substitute a diced sweet potato. Delicious! Just dice it, roast it in the oven with olive oil, butter and taco seasoning mix. So good. Thanks for sharing! Made this tonight and it was delicious. Being the New Mexicans that we are, we rolled it a tortilla with some homemade salsa and ate it as a burrito. Yum! my 11 year old daughter decided to make dinner yesterday and this is the recipe she came up with! She cooked it while I was at church with my older daughter with help from her Daddy. It turned out delicious and we all enjoyed it! I love this so much! Thanks for sharing. I'm so glad she found it easy and you enjoyed the recipe. We were issued a challenge by our church as part of a contentment project. I used your one chicken 5 meals recipies as my basic plan for our family of three adults. Our challenge was $2 per day per person. we had oatmeal for breakfast, peanut butter or leftovers for lunch and your chicken meals for dinner. certainly gave us a new perspective. Your chicken recipies helped. Loved the soup, chicken salad, casserole and beans. I would roast the chicken in the oven next time. Thanks again. Glad to know the recipes came in handy for you! Thanks for sharing.